Honor has just sent out a save-the-date for the launch of its 20 series of smartphones. 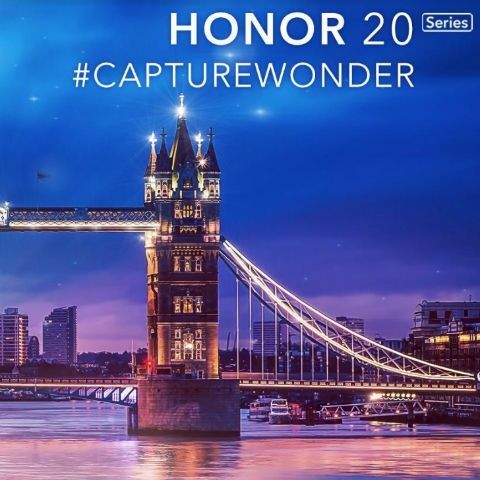 The company has officially confirmed that the Honor 20 and possibly other phones in the series would launch on May 21 in London. The save-the-date notification comes with an image that stresses on the low light photography capabilities of the upcoming Honor 20. There’s also a play on the number 4 in the invite which was sent with a mathematical problem to solve. "444+4x4x4+(4+4)/4+44/4" was teased as the launch date for the Honor 20, which translates to 521 or 5/21, i.e May 21. However, given that the number 4 is clearly an easter egg here, it’s possible that the Honor 20 will launch with a quad camera setup at the back. Some specs of the Honor 20 leaked just a few weeks back. The leaks have suggested that the smartphone could come with three cameras at the back, along with an upgraded battery and processor. The triple camera setup on the Honor 20 was rumoured to feature a 48MP main sensor + a 20MP Ultra Wide lens and an 8MP telephoto lens. On the front, the phone is expected to feature a 32MP selfie shooter. Further, the Honor 20 could get a 6.1-inch display and feature Huawei’s Kirin 980 chipset, since the Honor 10 was launched with the Kirin 970. Features like GPU Turbo, CPU Turbo and others could come in tow. The battery on the Honor 20 is expected to have a capacity of 3,650mAh with 22.5W fast charging. This is a little more than the 3,400mAh battery on the Honor 10. The device is expected to launch in 6GB and 8GB RAM configurations with 128GB internal storage on both variants. There’s a third 8GB RAM/256GB storage variant also expected.